In the first volume of his memoirs, As Far As I Remember, Michael Bawtree told the story of his youthful years, from his birth in Australia to growing up in England during and after World War II, with an education at Radley College and Worcester College, Oxford and a two-year stint in the British Army. In this second volume he recounts his experience as a raw new immigrant in Canada, and his first steps as a professional actor, a university instructor, a book critic, dramaturge and playwright. 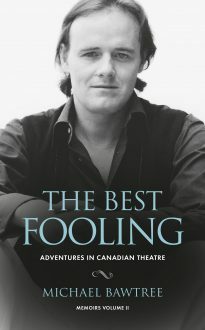 In the years that followed he made a name for himself at the newly-founded Simon Fraser University, where he initiated the theatre program, and at the Stratford Festival, where he eventually served as Associate Director and director of the Third Stage, before leaving to freelance as a theatre director both in Canada and the USA. In 1975 he founded COMUS Music Theatre with Maureen Forrester, and went on to establish himself as a pioneer in Canadian music theatre development. The volume finishes in 1977 as he is on his way for the first time to the Banff Centre, where he was to play a major role in the following ten years. Michael’s story, elegantly and amusingly written, gives us a vivid picture of Canada’s theatre activity in the sixties and seventies, with honest though not always flattering portraits of some of its most distinguished artists. He is also open and honest about himself, recounting his failures and well as his successes, and sharing with us what became the love of his life.